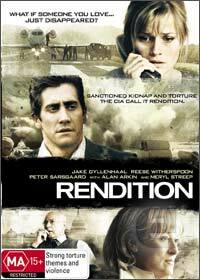 Rendition is a modern classic drama/thriller by director Gavin Hood who puts together a star studded cast which includes Jake Gyllenhaal, Reese Witherspoon, Peter Sarsgaard, Alan Arkin and Meryl Streep that is based on actual events of the CIA's rendition protocol. The rendition protocol was created to detain suspected terrorists by the United States government which allowed them to transport these suspects to other countries in order to gain information from them. Unfortunately this information was generally "tortured out" from the victims and there was dubious doubts as to the whether the information was accurate or were they trying to appease their captors. The movie Rendition revolves around a suspected Egyptian-American terrorists who disappears on a flight from Cape Town to Washington DC. With no contact from her husband, his wife (Reese Witherspoon) takes matters into her own hand and through the help of a college friend who works for a Senator attempts to locate her husband. Without spoiling the film as there is quite an interesting twist at the end which I could not foresee, Gavin Hood does an amazing job at directing this movie as four different stories are told which all link together. It's a truly engaging, gripping and disturbing movie from the start which shows the human courage of the characters involved. Brilliant video and audio quality, the DVD features a great documentary on true events of Rendition and also some in-depth commentary by the director Gavin Hood.